Dr. Mark E. Johnston is an internationally recognized LASIK surgeon who has presented at numerous local, national, and international conferences and continuing education seminars. He is one of the most experienced LASIK surgeons in the Nebraska region, having performed over 50,000 procedures. He is the Medical Director and Chief Surgeon at Nebraska Laser Eye Associates. Dr. Johnston has been performing laser refractive procedures since 1995 and corneal surgery since 1985. He underwent LASIK himself in 1998. 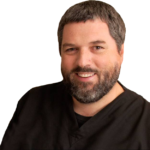 Dr. Johnston graduated from the Dalhousie University in Halifax, Nova Scotia. Dr. Johnston completed his residency training in Ophthalmology at the University of Western Ontario in London, Ontario. Dr. Johnston then received fellowship training at the University of Michigan in Ann Arbor, Michigan in Corneal and External Diseases. Dr. Johnston is a member of the ASCRS. He is a board-certified Diplomat of the American Board of Ophthalmology and Fellow of the Royal College of Physicians and Surgeons of Canada.